Morocco, which is the only African country having both the Mediterranean and Atlantic coastlines, is continuously modernizing its naval defense capabilities to protect its water and deter enemies. But the Algerian military Generals, who are tightening their grip on the country on the verge of implosion due to deep sociopolitical crisis, are getting hedgy whenever world press outlets report a Moroccan arms purchase. According to the US Defense Industry Daily, Morocco is acquiring US-made anti-ship missiles AGM, RGM and UGM. 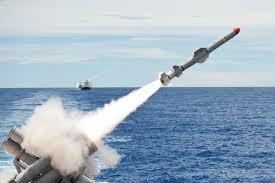 The 2,000-pound AGM-158 JASSM is intended to be a stealthy, inexpensive guided cruise missile. It is designed to attack well-defended targets without putting its carrier aircraft in the crosshairs of new long-range surface to air missile systems. In a reaction to the latest provocative presence of Algerian military ships in the Mediterranean basin, Moroccan navy reportedly deployed its frigates and new warship off its northern coast. The move also seeks to counter criminal activities at sea, including smuggling, illegal migration and terror plots. In 2017, Royal Moroccan Navy and NATO’s Standing Maritime Group 2 (SNMG2) carried out a series of exercises off the coast of Casablanca. SNMG2, consisting of flagship Spanish frigate ESPS Blas de Lezo and Turkish frigate TCG Gokceada joined Royal Moroccan Navy ships Mohammed V and Sultan Moulay Ismail for advanced maritime cooperation and training including a ship boarding exercise. According to NATO, Morocco is an “active partner” in the Maghreb and “critical to the stability and security of the Mediterranean Sea”. The Moroccan Navy also took part last year in exercises with the US Navy’s Ticonderoga-class guided-missile cruiser USS Vella Gulf (CG 72). On this occasion, Moroccan patrol vessel P306 RMNS Commandant El Harti conducted maritime interdiction operations (MIO) and small boat defense procedures with the cruiser.